Another victory for Rafael Nadal. Now, anyone who reads my posts will realize th at I am an indefatigable fan of Nadal. And yes, I am. Why not? Well, what is sport all about? Spirit, talent, stamina, strength, mental acuity and most of all steely nerves. And according to me, Nadal is 'controlled agression' in tennis. Attitude - Amazing. Rafael Nadal's eyes glistened when the Spanish flag billowed above the flagpole. He swallowed hard as "La March Real" played in the Olympic Green Tennis Center. They don't do that for you at Wimbledon. Monday, Nadal officially becomes the No. 1 ranked player in the world. The 22-year-old has reached the pinnacle of his sport through a stunning streak of tour and Grand Slam success. But what happened to him Sunday - winning a gold medal for Spain, by beating Chile's Fernando Gonzalez in straight sets - was even sweeter. "To win here, the feeling is a little bit more special," Nadal said. "In tennis, Slams are more important. "But for the sportsman, the Olympic Games are more important than anything." And it's not an easy tournament. It muddies up the schedule. Nadal himself was already unhappy with how compressed th e men's schedule was this summer. Then last week, rain delays forced competition late into the night here: Nadal was warming up at midnight for a singles match. After the end of competition Sunday, the players headed to New York for the U.S. Open, which begins one week from today. But, in truth, the rich and famous tennis players always seem to embrace the experience. Andre Agassi was thrilled to win gold in 1996. Four years ago, Andy Roddick was wrecked when he was eliminated early. In Beijing, Roger Federer - who has always dreamed of an Olympic medal - acted like a giddy kid on Christmas morning when he won the doubles gold for Switzerland. Venus and Serena Williams, who won doubles gold Sunday, are committed to the Olympics and want to play in 2012. And Nadal completely embraced the Olympic experience. He marched in the opening ceremony. He stayed at the athletes' village, where he was the most popular athlete. Others skipped the village; Federer tried to stay there but only lasted one night, mobbed everywhere he went. Nadal was also besieged with photo and autograph requests, but he didn't seem to mind. He attributed his success on the court to the experience. "The reason I won this title," Nadal said, "is because I have a fantastic time here." Nadal is having a fantastic time everywhere: Paris, London, Beijing. He has won 38 of his past 39 matches, including the French Open and Wimbledon and finals, and now the gold medal. . When he won the match - dressed in Spain's colors in a red shirt and yellow headband - Nadal fell spread-eagled on his back. When he regained his feet he launched a tennis ball out into the Beijing night as the Spanish fans - whose country is having an epic sports summer - cheered wildly. Monday, Nadal will end Federer's 237-week reign as the world's No. 1 singles player. Federer has been completely gracious about Nadal's ascendancy. "That's what I hoped," said Switzerland's flag bearer. "That if somebody were to take it away from me, he would have to play an incredible tennis schedule, win the biggest tournaments, dominate the game, basically. I think Rafa totally deserves it." Sure, tennis may have more important tournaments. But isn't it great to have such perceptive athletes in the Olympics? Federer's sportsmanship credentials are long-established. Nadal is growing into his role, working on his English, and charmingly willing to participate in give-and-take. On Sunday Nadal was asked by a reporter from Bangladesh if he felt responsibility to help the sport in underdeveloped countries. "If Bangladesh wants to do something with me," Nadal offered. "You know my English is not perfect, so it is difficult to express something like this. If I can help with something to Bangladesh, the people just have to tell me and it's going to be a pleasure for me always." Nadal may have more important tournaments. But he understands what the Olympics are all about. "When I win here, I feel like I win for all the country," he said. "That's more special, no? "I win for a lot of people. Not only for me." I remember an article on the chap, wherein he said that his upbringing is instrumental in making him who he is. It seems Toni, his uncle as well as his coach, told him that the day he'd break a racquet in anger, would be the day his tennis ends... stops! Wow, thank God no one told that to McEnroe, or else we'd have been denied all the fireworks that underlined the tennis of the Borg era! 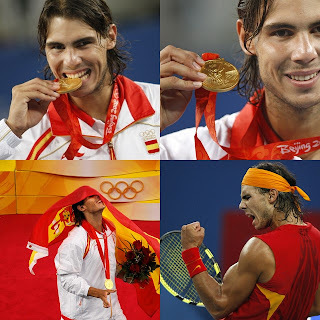 So, Nadal won a gold medal in Olympic tennis - well, I guess he is at the right place at the right time! Wimbledon, French Open, World Number 1 ranking and an Olympic Gold. Can it get better? Flushing Meadows holds the answer. A sad paradox however is Roger Federer. He tried over and over. But Roland Garros still evades him. He tried over and over. But the singles Olympic Gold eluded him when he was at the top of his game in 2004. He wept. Since he knew the worth of that round yellow medallion. Ask Roberto Baggio what it means to miss in a sport event that comes once every 4 years. Ask Zidane. Ask Federer.... Even the Nadal fan in me wished for a better story here. These Olympics are all about nerves. A small lapse in concentration and boom... you're out for four years. Take the case of our boxer Akhil Kumar. Someone who could beat a former champion, loses in the next round? Why? Why do all our Indian athletes perform below their personal best at the Olympic stage? I say Indian, since Ms. Isinbayeva does not know how to break another person's world record. She is too busy breaking her own! 25 cms higher than her closest competitor? Wow!!! It all has to do with nerves according to me. The greater the mental power, the greater the sporting success.